Durkee is no longer making this product in the 6.5oz bottle. This product is now available under the Weber Brand. Weber Smokey Mesquite Seasoning 4 x 6 oz (684g). 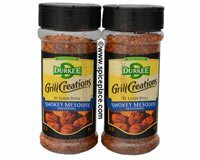 With Durkee Grill Creations Smokey Mesquite Seasoning you can Go Southwest ... without leaving the comfort of your kitchen table. Grill Creations Smokey Mesquite Seasoning is a blend of spices that gives your favorite cuts of pork, steak and poultry a warm, authentic Southwest flavor. Your guests will love Smokey Mesquite seasoning with its subtle blend of sweet mesquite, smoke, salt, chili pepper, garlic, onion and red pepper. Uses: Sprinkle this spirited southwestern seasoning on choice cuts of pork, steak, and poultry for mouth watering flavor. Ingredients: Salt, Chili Pepper and Other Spices, Sugar, Garlic, Onion, Red Pepper, Natural Smoke Flavor, Extractives Of Paprika (For Color).